Are You Working Out Constantly, Taking Supplements You Can’t Pronounce, Eating All The ‘Right’ Foods… And STILL Struggling To Build The Body Of Your Dreams? But the truth is many people never get the results they want, even after years of spending time in the gym. But if you haven’t, this is for you. I bet you remember the first time you decided to work out and get into shape. You were motivated to work hard, and you probably even made some gains here and there, but the progress probably wasn’t as rapid as you’d have liked. You may have even trained really hard for a year, or possibly longer, with little or no results to show for your efforts. It’s not your fault, though. You were just doing what you were always told, even if it wasn’t the best advice. If that happened to you, I’m truly sorry. If You’re Not Getting The Results You Want, Something Has To Change. Make any excuse you want to, but don’t deny this FACT: something isn’t right if you’re not progressing toward your goal of LOOKING GREAT NAKED. 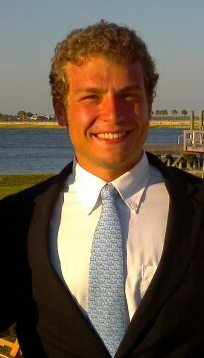 My name is JC Deen, fitness coach, consultant, trainer, and writer. I’ve been seen in Forbes.com, Men’s Fitness, Huffington Post Live and have written for Bodybuilding.com, Livestrong.com, the Alan Aragon Research Review, Men’s Health, and ZenHabits.net. 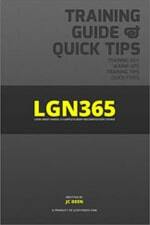 I created LGN365 because I saw a gap in most of the fitness information I devour – especially the how-to courses. I’ve been training since I was 13 years old, but it wasn’t until about the age of 20 that I started to get it right. As you will see in the series of photos below, I’ve managed to maintain an aesthetically-pleasing physique since about 2007. Sure I’ve been heavier or lighter depending on multiple factors affecting my life, but maintaining this look hasn’t been difficult at all. And this is what I want to share with you – the how-to’s of building your physique, and then how to maintain what you’ve built. I put everything in this course I’ve found to be beneficial for my clients, as well as the personal workout routines I design for myself. That may sound like a lot, and it is. The reasoning behind my training and diet methods. Why you need to create goals that are believable. The insight into my personal fitness ideals. How to set up your diet and training for maximal benefit. Learn muscle gain principles you can apply to any routine. Train effectively on a 3, 4, or 6 day schedule – it’s your choice. Learn how to set up your diet for maximal fat loss. Maintain your lean body mass with relative ease with 1 of the 3 programs. How much training it really takes to maintain your muscle. Discover how fat loss really works through evidenced-based ideas and application. Need to drop some fat quickly? Get on the 14 Day Fat Loss Kickstarter plan and then ease into one of the main fat loss programs. Lose fat quickly and safely. Prime yourself for steady fat loss on one of the primary LGN365 programs. Build the confidence you need quickly to stick with the program. Learn how to effectively warm-up for training sessions. Discover how to use foam rolling for better mobility and increased range of motion. Improve muscle activation with simple ‘tricks’ that take less than 2 minutes to perform. Improve performance and reduce risk of injury. 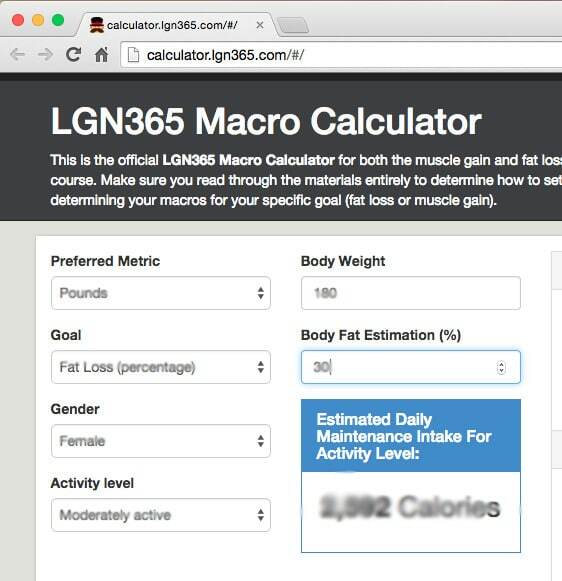 You get fat loss and muscle gain calculators that are easy to use. No need for fumbling through confusing equations. Based on height, weight, gender, and body fat percentage. Establish a baseline calorie recommendation instantly. Calculates Protein, Fat and Carbohydrate Macronutrients. 12 High Quality Videos with lifetime viewing access. Know exactly what the exercises look like. Never ‘guess’ what exercise you should be doing. “The reason it finally worked for me was that I let the guide be in charge instead of me. I handed over the responsibility, knowing and trusting that JC had done it right. I knew how to do the heavy lifting in the gym, now I just had to follow the nutritional guidelines and things would be fine. Before, I would sit and use the different formulas to get my BMR, set macros, count percentages, adjust and get the right numbers, but since I didn’t trust them upon myself they were useless. 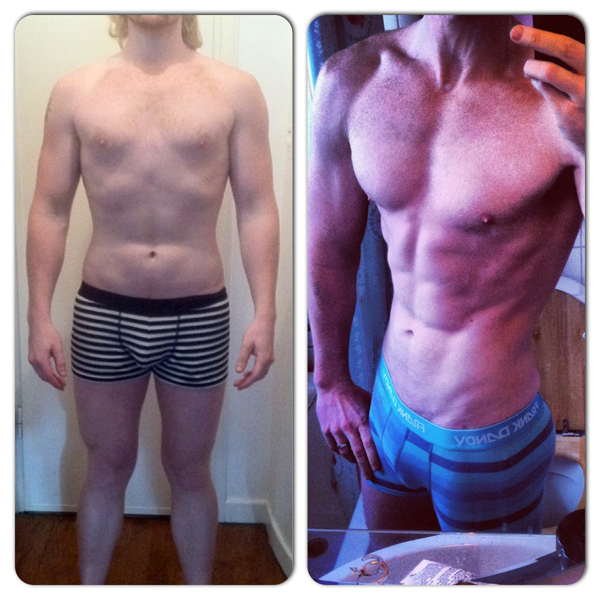 “Through JC’s guidance, I slowly began to grow a better relationship with food and fitness. Dieting wasn’t an obligation. Actually, I wouldn’t even call it a diet. It’s a lifestyle now. As long as my pizzas fit into my macros, I enjoy it. Keyword: GUILT-FREE. 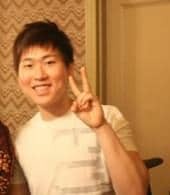 His program helped me shed off the last few lbs. that I’ve been plateaued on for the longest time. Eating fewer carbs on days I don’t work out and carbs on days I do work out made so much sense. Reading it just made me realized how ignorant I was. All this time, I have just been doing low-carb all the time. My workouts and just my days were so groggy. By the end of each day, I was worn out. I’ve been doing all of this hard work when it could’ve been done quickly and efficiently. With LGN365, you essentially have a full year of training and diet strategies mapped out for you. It’s as simple as that. Imagine having your training and diet questions answered so you could do nothing but focus on building the body you want over the next 8 weeks, 20 weeks, or even the entire next year? How much progress could you make with a focused, and direct plan? I bet you’d make a lot, and if you didn’t, I’d honestly be shocked. "Yeah, Yeah, But I’ve Tried Everything Before. Can This Really Work For Me?" You’ve probably tried some body-transformation programs in the past. You may have tried many of them. I know I sure did. When I was starting out, I jumped from program to program. 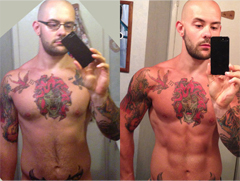 I even used to go back and forth between fat loss and muscle gain every other week. But nothing resulted from my efforts. Wait a second. I did actually get results, but they were far from positive. I was tired, worn out, and I still looked the same. It all changed for me once I figured that building a body you’re proud of happens through diligence, hard work, and doing the right things. It’s not about spending all your time in the gym, or testing out training programs and fad diets in hopes of finally getting it right. Please understand that LGN365 is not just another fitness course with impractical advice, rigid meal timing guidelines, training programs that are too complicated or take up a ton of your precious time. LGN365 contains what I like to call the minimum effective dose. “Long term dieters can probably relate to the months of wheel spinning I endured as I jumped from one program to another trying to find the solution to the dreaded fat loss plateau. JC’s manual gave a simple and effective structure that was flexible enough to adjust to my lifestyle. The strength routine allowed me to maintain strength and retain muscle mass as I progressively reached my fat loss goals. One of the biggest aides was the nutrition program. 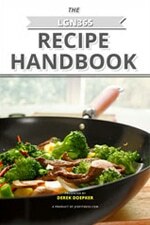 It helped me set up, adjust, and maintain a steady fat loss diet. It was effective in which adherence was effortless. “I am a hardgainer, a member of the metabolic elite, a gift and a curse when all you want to do is pack on size. I’ve tried many programs, tried many mass diets, and I couldn’t seem to find one that worked and still allowed me to have a life. After a run in on Fitocracy and subsequent Twitter conversation, JC told me about his program. It looked straight forward, calculated, and manageable in terms of required gym time and suggested diet. “Let’s give it a go” I thought. Plug your metrics into his metabolic calculator, eat the kCals it tells you, and follow the lift progression. It’s fool-proof. I gained 4 pounds in 6 weeks, something that for me, seemed previously unattainable. I also cut a bit of fat on top of my abs, something that “can’t be done” while gaining right? This program works. JC was great to communicate with and was readily available to answer any questions I had. The entire time I got the sense that this wasn’t just some gig for him, he really does care about about helping people reach their fitness goals. “This program is just awesome. From the nutritional aspect to training aspect, it has it all. There are multiple training options for you to choose from to suit your schedule.After following this program, I have experienced some serious improvement in my physique. Whether you need some guidance getting your body fat into the single digits, or want to build some muscle and strength, all the information is laid out in plain English – no hard-to-understand scientific jargon (although I do back up my work with scientific literature). I can assure that you’ll find LGN365 to be invaluable for your physique-building efforts. And if you don’t, I DON’T WANT YOUR MONEY. Just ask for a refund within 30 days, and you got it. No questions asked. Although, I feel it’s highly unlikely due to how much you’ll gain from the content. For the most part, we’re not that different. Outside of gender and some other genetic variables, our human bodies all work and function similarly. However, schedules, and temperaments can vary wildly. And that’s why I’ve included various training routines. One fat loss routine only requires 2 days of weight training and the bonus hypertrophy program I threw in gets you in the gym 5-6 days per week, if that’s what you’re into (this is my personal favorite). I like to take a focused approach. We’re talking about your goals – and I want to get you from Point A to Point B without a bunch of guesswork. I’m also adamant on training efficiently for the goal at hand. This is why I’ve included various training techniques such as Reverse Pyramid Training (RPT), as well as some Rest-Pause (RP) techniques that maximize your results with a minimum of Wasted Time (WT). I wasted a lot of effort early on when I was building my physique and I wouldn’t want you to repeat those same mistakes I did. + Build muscle and strength quickly. + Maintain muscle on a fat loss diet. + Get in and out of the gym in a hurry. + Improve your max strength. + Build muscle without using super heavy weights all the time. + Slash your time spent training almost in half. + I don’t have to write anything here – everyone hates wasting time. I want you to succeed at all costs. When you commit to LGN365, you’re officially in the JCDFIT family. We will serve you fully, and give you our best. So if you ever have a question, or need help/support, we’re only an email message away. No one gets left behind. If you’re not satisfied with the materials, or you’re not getting results, or if you just feel like it’s not a good fit — email me for a full refund. You have my word, and my 60-day money-back guarantee. If you aren’t entirely satisfied, just tell me. We’ll make it right, and if we can’t, you get your money back. How to get your habits to stick using the ‘5-minute rule’. Why you should create a habit first and focus on results later. Learn why the ‘no time’ excuse is not an excuse at all. Discover why ‘shocking the muscles’ and ‘switching programs’ might be killing your progress. Discover why you should ‘trust the process’ and believe in what you’re doing. The importance of ‘course-correcting’ along your fitness journey. Why setting goals based on a timeline is not always the most conducive to achieving them. Why you should strategically add intensity and volume for building muscle mass. The importance of building a balanced physique through movement variations. Why people on the Internet will make fun of you if you don’t train your legs. Learn why the small exercises (face pulls, band work, and assistance work) can benefit you in the long term and keep your joints healthy. Why you should never compromise taste for the sake of eating healthier. Learn why your diet must be manageable, and how your ‘willpower’ to stick with your diet can only take you so far. How his studies of the raw vegan diet influenced him to be creative with his food selection and baking alternatives. Why he decided to use some ingredients such as almond flour for baking and kale to make ‘chips’ to cover your salty cravings. 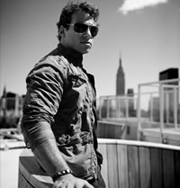 “I had the pleasure and opportunity to work with JC as a test subject for his fitness course. First off, he isn’t kidding. NO BS. Just what works. The course is easy to read but packed with information. It brought me right through a good warm up and into a great workout.The workouts rotated and the concepts and intensities changed as well to allow my body to adjust and grow. His diet and workout is tied to the goal you choose. Gain muscle, one diet and program. Lean and tighten up another diet and program. I have done a lot of reading on fitness and nutrition. Frequently, I will come across a concept and think, wow, I should include that in my diet or workout. But, I have no idea how to incorporate it. He takes a bunch of winning concepts and puts them together in an easy to follow format. “I’ve always worked out hard on barbell lifts and eaten more protein than my budget could afford, but I’ve never been particularly lean. Last summer this got even worse, I injured my back while deadlifting and I couldn’t even stand up straight for months. After months out of the gym, I had ballooned from 202lbs to 224lbs, while losing a ton of muscle. I was fat and I was depressed and I was even wondering whether it was worth working out anymore. That was until JC mentioned a new program he wanted to test.I’ve been a long time reader of JC’s. 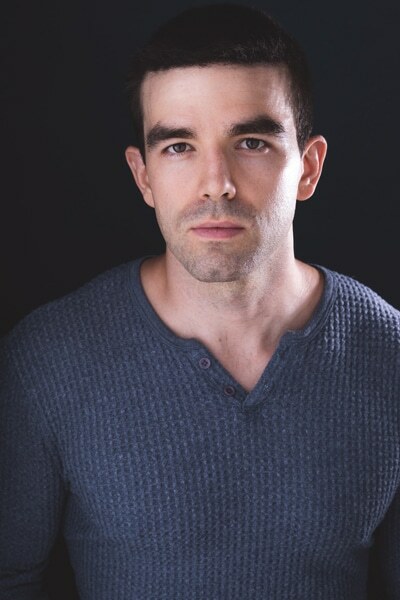 His advice is straightforward and based upon hard science instead of the myths that have been perpetuated throughout the fitness industry, so when he said he had a program coming out, I immediately signed up. He sent out the program a week later. I chose one of his fatloss programs and there I was, back in the gym again. At first it was agony to be back in the gym, but I put JC’s stretching/mobility routine into practice because I wanted to heal my injuries and really do it right this time. Well, for the first few weeks, nothing happened. My bench and squat stayed pretty much the same, my deadlift was pretty much nonexistent, and my chin ups were a struggle. But then, almost overnight, I started to see improvements. My bench started skyrocketing, I was adding 10 pounds to my squat every workout, and my deadlifts were out of control. Then, people started commenting about how good I looked. At first, I thought they were just being nice, but then after having people repeat the same thing, it started to sink in. At this point, I knew there was no turning back, I was fully committed to the program and my results showed the smart training principles the program was based upon. 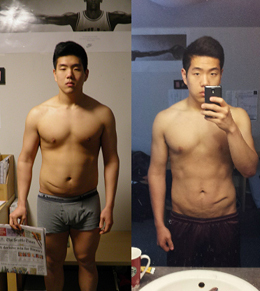 Over the 16 weeks of JC’s Fat loss program, I had the following progress. I’ve lost 30 lbs and gained a lot of muscle. My body feels better than it ever has and even better, I look great and feel way better about myself. Thanks JC for putting an amazing program together, you’ve made a really big impact on my life. What specifically about the fitness course (LGN365) has helped you the most? “My personal feeling is that the best feature of LGN365 is the material dedicated to helping the reader develop a mindset that will allow him or her to integrate fitness goals into a healthy lifestyle, rather than forcing everything else to revolve around the gym. The pitfalls and misconceptions that are touched on seem to be all too common for newer lifters of all ages, and the text spends quite a bit of time helping the reader cultivate a mindset free of obsession, neurosis, and uncertainty. What challenges has LGN365 helped you to overcome with your personal fitness journey? “My own mindset. Although I have always been relatively thin for most of my life, I nevertheless suffer from many of the symptoms of the infamous Former Fat Boy Syndrome. I often find myself overly preoccupied with getting fat while attempting to put on mass, and even when I finally achieve positive results, I often have a difficult time recognizing or acknowledging them. And what happens when I do finally have the size I want? Will I be able to lose the extra fat? The self-questioning can be endless. “Most specifically, the thing I liked most about LGN365 was the fact that it is a program based around actual science and factual information which is combined to offer a comprehensive program. “The number one thing I usually struggle with is trying to remember all of the ins-and-outs of properly provisioning a diet (maintenance calorie info, macro breakdowns, etc). LGN365 has been a tremendous help with this and made life so much easier. I found RPT, to be a really efficient way to get in more volume while still making strength gains with a certain rep bracket. “The variety in the workouts has definitely helped the most. I tend to get stale on things pretty fast and the fact that there are so many great programs has helped me immensely. Looking Great Naked is about training smarter, not always harder. But don’t get me wrong… You still have to train hard. In as little as 4-7 hours per week, you can be well on your way to achieving your fat loss or muscle building goals. Along with this, you’ll get to download all the fitness course materials immediately – the Getting Started Guide, The Fat Loss Manual, The Hypertrophy Manual, The Recipe Guide, the workout routines, macronutrient calculators and all of the videos.